Support for free expression online remains unchanged since 2013 in Lebanon, Qatar, UAE, and Egypt. An “average” drop in support for free expression online was mostly due to significant drops in Tunisia, where residents are still witnessing the re-establishment of social and political order after a tumultuous revolution, and in Saudi Arabia, where their king had died only weeks before this survey’s fieldwork began. Most respondents who use the internet post messages and comments on social media, repost links and content generated by others, search for news content, and share news with others online. Despite the internet being an important communication tool for many, most nationals believe there should be limits to online expression. Support for the idea that people should be able to criticize governments online fell in Saudi Arabia, Tunisia, and UAE. Supporters of freedom of expression online are more likely to believe they can have political influence by using the internet (54%), compared to those who disagree with freely expressing ideas online (33%). They also worry more about government surveillance (44% vs. 28%), although this does not appear to have curtailed their internet activity. A narrow majority of nationals (52%) agree that it is OK for people to express their ideas on the internet, even if these ideas are unpopular. This represents a decline from 59% in 2013. A plurality say people should be free to criticize governments online (44%), while about one in four (24%) disagree. Saudis and Tunisians, in particular, show a decline in support for freedom of expression over the past two years. 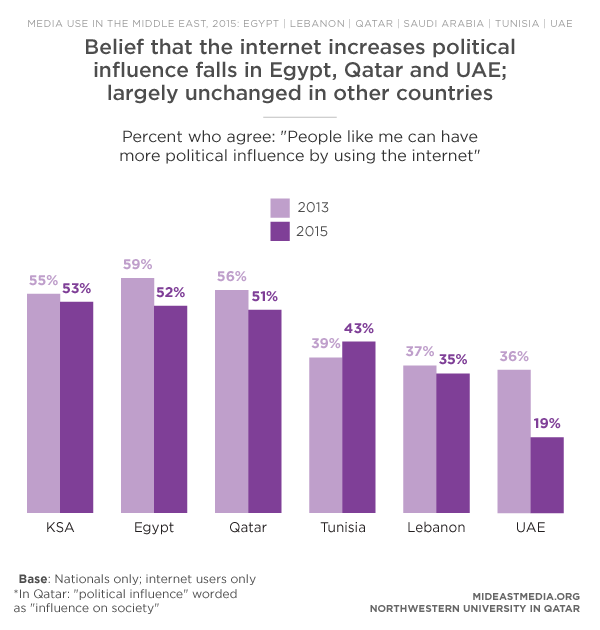 Arab nationals are concerned about what is advisable to do online. About two in five nationals feel comfortable saying what they think about politics (39%), down slightly from 44% in 2013. Additionally, fewer than half (45%) think it is safe to say what one thinks about politics, compared with 48% in 2013. Since 2013, Egyptians’ and Tunisians’ comfort talking about politics has sharply declined (43% in 2013 vs. 33% in 2015 in Egypt), (44% in 2013 vs. 34% in 2015 in Tunisia). Tunisians, along with Saudis, are also less likely to believe it is safe to talk about politics online compared to two years ago (58% in 2013 vs. 49% in 2015 in Saudi Arabia), (46% in 2013 vs. 37% in 2015 in Tunisia). Forty-eight percent of nationals feel the internet in their country should be more regulated than it is now. Desire for more regulation varies from 67% in Qatar to 35% in the UAE. Half of the surveyed countries support more internet regulation compared to 2013 (Egypt, Qatar, and UAE), but support decreased in the other half (Lebanon, Saudi Arabia, and Tunisia). Younger nationals, who spend more time online in general, express substantially more support for freedom of speech online than the oldest age group (60% for 18-24; 38% for 45 and older). They are also more likely to support freedom to criticize governments online (49% vs. 34%) and to believe candid expression of political opinions and beliefs online is safe (51% vs. 34%). Sizable minorities worry about governments and companies checking their online activities (38% each), a figure unchanged since 2013. Adults in Saudi Arabia worry most about government surveillance (47%), while Egyptians and Lebanese are generally less concerned (26% each). 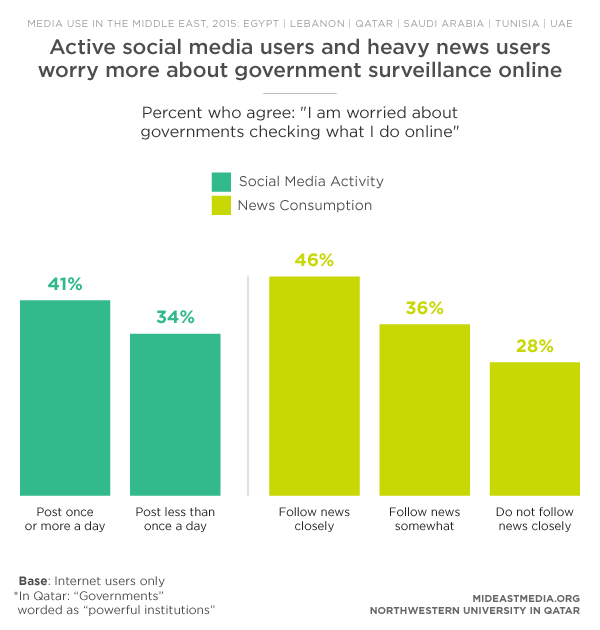 Qataris and Tunisians express more concern about government surveillance in 2015 than they did two years ago. Concerns about government surveillance of online activity appear correlated to support for citizens’ freedom of speech and political efficacy. 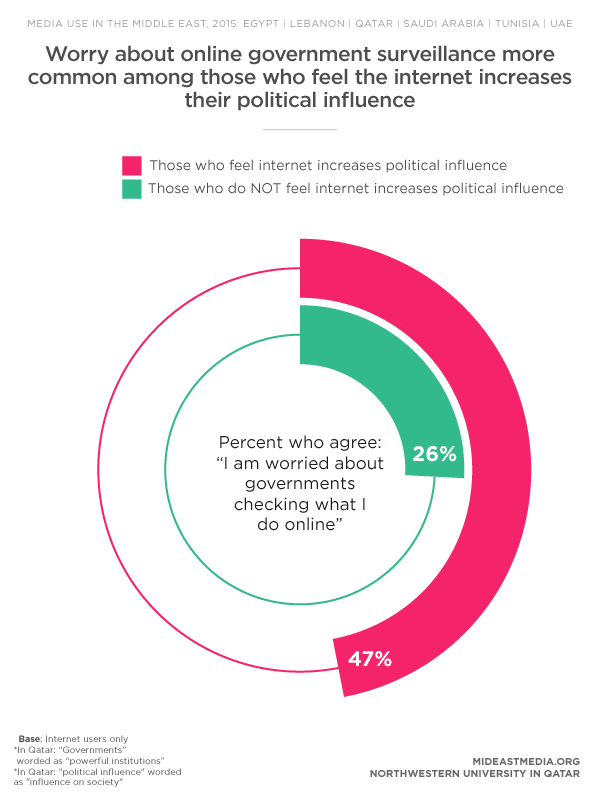 Those who feel the internet offers political empowerment tend to worry about governments checking their online activities, as are those who want more internet regulation. People active on social media, posting comments or messages on a daily basis, worry more about government surveillance than those who are not active on social media. Similarly, those who pay close attention to news worry about surveillance. Those who worry about governments watching their online activities are also more likely to share news content online than those who don’t (70% vs. 51%). Non-Arab expatriates, particularly those from Asian and western countries, worry more about government monitoring of their online activities than nationals. Arab expats are equally unlikely to be concerned about online surveillance by governments. Arab countries’ reputation for being among the most censorial in the world, whether true or not, may lead non-Arab expatriates to have an inflated fear of government surveillance than Arabs themselves. People who say that being online can give people like them more political influence are more supportive of freedom of expression, including the right to criticize governments online (59% vs. 37%) and to express unpopular ideas on the internet (73% vs 55%). They are also more likely to share news content. 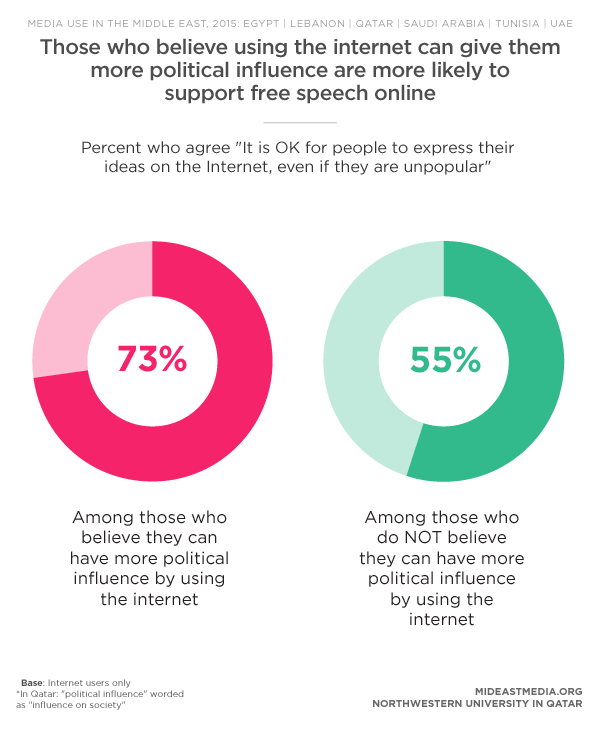 There is a close association between the belief that the internet can provide greater political influence and support for free expression online. While support for online free expression is more common among those who believe the internet can increase political influence, and the reverse is also true: belief that the internet can provide greater political influence is more common among those who support online free speech. 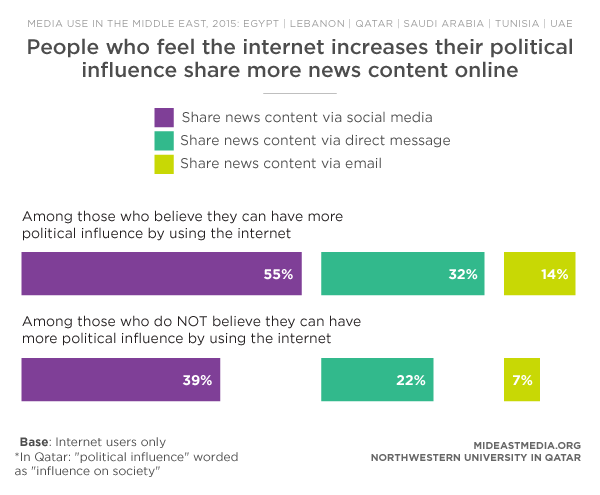 Belief that the internet allows for more political influence fell among nationals in Egypt, UAE, and Qatar, but held steady in Lebanon, Saudi Arabia, and Tunisia. Nationals who believe the internet allows them political influence are more likely than those who don’t to say it has also increased their contact with those who share similar political views (59% vs. 26%). Progressives are more likely than conservatives to believe in the internet as a tool of political empowerment (50% vs. 43%).